Being accessibile - Work ... Uncaged. When you work in an office setting your presence alone sends a message: I’m here at work and available. When you’re working remotely, there is no physical indicator. You need to make sure you’re not invisible. The primary way to make sure you’re not invisible is by communicating pro-actively. My favorite way to do this is via a daily update. It’s hard to not be noticed when you’re reaching out. What might be even more important than initiating the communication is being accessible. The reason is pretty simple. People will take note of your accessibility if they are already thinking of you. 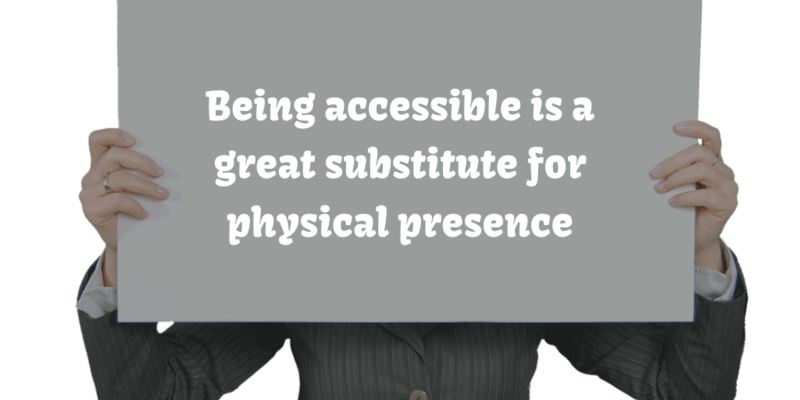 Being accessible is a great substitute for physical presence. How do you make sure you’re accessible? When you’re not in the office with your colleagues, accessibility shifts from the physical to the virtual. Many organizations take advantage of instant messaging, video conferencing, email, and the phone. I’m happy to use whatever gets the job done. However, I like to make sure that others know what to expect from me via the various mediums. For example, I don’t have notifications for emails. I’ve always thought of email like mail just with an ‘e’. Most of us don’t go check the physical mailbox every few minutes and shouldn’t do that for email either. I check my email a couple of times a day and work hard at maintaining Inbox zero, but it’s certainly not instant. That’s where the “instant” in instant messaging comes in. This is my virtual shoulder tap. I make sure I log on to relevant systems whenever I’m available. When the system allows for it, I also set my status. For example, with most instant messaging platforms you can set yourself as ‘available’ or ‘away’. On some you can also set yourself as ‘busy’ and perhaps even declare a status like “heads down on awesome report”. As a side note, that is about the only thing I would love to see Slack add, although there is a workaround. Regardless of the mechanism or the tool, I make sure that I respond in short order when I’m set as available. I try to respond as though I was sitting at a desk and someone just walked up. That creates expectation and validates my accessibility. On the flip side, I tend to delay my responses when I’m not set to available. That also enforces the expectation to trust the IM status. The phone is a way to always get to me. It’s rare that people call since IM is sufficient for a lot of stuff. That said, it provides a safety net to get to me almost 100% of the time. I don’t give my number out to many people for that very reason. Video chats are generally used for scheduled meetings. Every now and then it’s nice to just fire up a quick video chat and it increases how people will feel about your accessibility. I’m a big fan of Google Hangouts, but Room is awesome for really quick video chats. I’m sure all of this is perhaps a bit obvious, but for me it took some thought and deliberate choices. For example, deciding to turn off email notifications and ignoring IMs when I am not set to “available”. It takes practice to stick to it, but it’s worth it. There is one last thing I do to make sure I am accessible. I’m not always at my desk or on my computer. I often move around my house and don’t always take the laptop along. It’s nice to take a long piece of documentation to the back yard and read it on the tablet or phone. Sometimes I step away from the desk to run a quick errand. I also enjoy pacing rather than slouching ever lower while trying to think through something. Still, I remain accessible. It’s rather easy if you have a smart phone. Set up instant messaging on the phone and maintain your accessibility everywhere. Just make sure you deal with notifications and IMs the same way as you would on the laptop. Many instant messaging platforms have a setting to automatically set your presence. It basically sets you to “away” after a certain amount of inactivity or available if you are using the device. I’ve tripped over that best guess feature a few times. My advice is to to turn it off whenever possible. Sometimes that feature gets a little weird if you are logged in on more than once device. I have noticed that sometimes being logged in from multiple places can set you as “away” from one device even if you’re on the other. At other times I get set to available and get random requests because someone saw me become “available”. It’s a bit of an annoyance, but setting your status manually is pretty simple. The expectations are totally in my control. The key is to be consistent about accessibility, communication and doing great work. Then rejoice in not sitting in an office to prove you’re getting stuff done.